My daughters were well into junior high by the time VeggieTales became popular among the preschool set, so I didn't have much exposure to the animated series—featuring anthropomorphic veggies such as Bob the Tomato, Larry the Cucumber, and Archibald the Asparagus—as a mom. 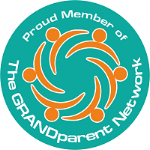 As a grandma, it's a totally different story. Bubby loves VeggieTales, and together we've shared many a tale. 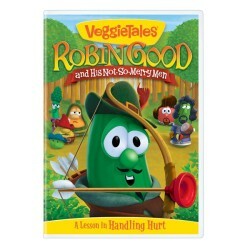 The most recent offering showcasing the songs, silliness, and stories with a moral from the faith-based characters is VeggieTales: Robin Good and His Not-So-Merry Men (approx. 50 minutes, $14.99, Big Idea Entertainment). I received a free copy of the DVD for review and was pleased to find that Larry the Cucumber—Bubby's favorite VeggieTale character because he's Bubby's favorite color—once again had a significant role in the show. The story goes that in the long-ago and faraway town of Bethlingham, Robin Good and his band of merry men helped the poor through fundraising (called "funraising" in the show). Then along comes a greedy, ham-hoarding prince who causes donations to dive and coerces Robin Good's friends over to the dark side. All that, of course, hurts Robin Good's feelings. Thankfully things take a turn for the better, Robin Good overcomes his hurt feelings, and little ones watching the show learn that there's no hurt too big for God. It's a sweet story, and some of the corniest parts (pun intended) come from the fun-raising efforts to get everyone to lend a ham. The DVD also includes a bonus short called Lenny & the Lost Birthday, "Silly Songs with Larry featuring Bubble Rap," and other faith-based goodies. What I loved about the DVD: This is the DVD that clinched my love for Larry the Cucumber. Not because he's green, though, which is why Bubby loves him, but because of his silly songs. And they are indeed silly...and catchy. Also, for kids who are a little bit older, the DVD has a pretty good explanation of leap year as part of the Lenny & the Lost Birthday short. For more information on this particular DVD, click on the image above (not an affiliate link). For more info on VeggieTales in general, visit www.VeggieTales.com.